Happy Halloween everyone! Who says this evening is all about the little ones? Halloween is fun for everyone even if you don’t go “Trick or Treating”. So I decided to make an orange, festive and healthy meal for this holiday and added some sweet flavor to the food. Wash and cube the sweet potato. Place in a pot of salted cold water and boil until fork tender, about 12 minutes. Drain and mash with the 1 tablespoon butter. Zest some orange rind onto a plate for garnish. Zest about 1 teaspoon into the olive oil. Season the salmon with salt. Melt the 1 teaspoon butter and add in 1 tablespoon orange juice and the light brown sugar. Mix well. In a non stick skillet heat the olive oil with orange zest. Place the salmon and cook for 3 minutes. Turn over and cook for 1 minute. Pour the brown sugar mixture over the salmon and cook for additional 2 minutes. 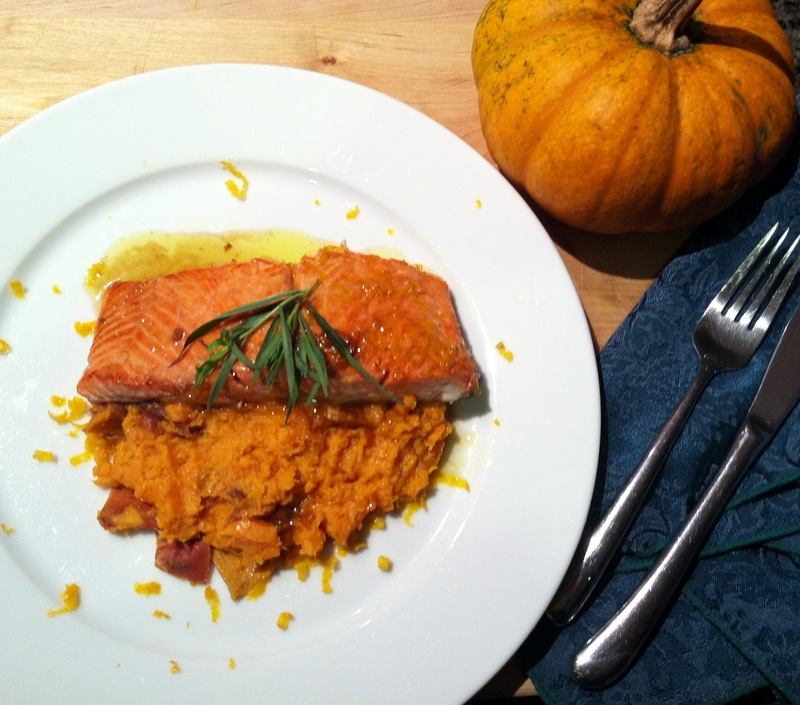 Serve the salmon over the mashed sweet potato.